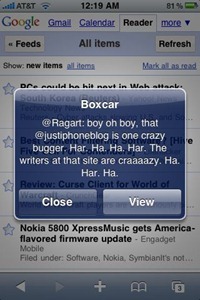 Boxcar is the first iPhone app I ‘ve seen that provides push notifications for Twitter “ and I ‘m happy to say that I discovered it via a comment last night here on the site, from its developer, Jonathan George. 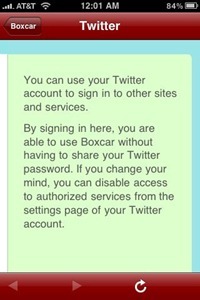 Although Boxcar offers push for Twitter on the iPhone, you need to know straight away that it is not a real Twitter client app. It pretty much exists solely to handle push for Twitter for you. On the plus side, it does ‘real ‘ Twitter push “ not just push between you and other Boxcar users “ the iTwitter model we saw earlier this week – but push for all @ mentions and direct messages aimed at your Twitter account. To begin using it you need to authorize it to use your Twitter account “ so it does not need to ask for or store your Twitter credentials. Then you let it know which Twitter account you ‘d like it to interact with when opening @ mentions that it has sent you alerts on. *** I ‘m not sure how it handles recognizing Twitter accounts, or whether it does recognize them properly “ since on first use it showed me my two installed Twitter apps, Tweetie and Twitterrific, but when I installed TweetDeck just to test, it did not add that to my options in Settings. 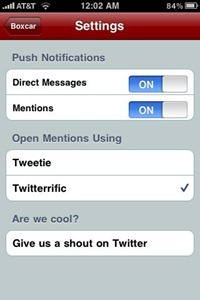 The only other setting you ‘ll worry about is toggling On/Off notifications for Mentions and DMs. Jonathan mentioned in his comment that the app currently polls every 5 minutes for new alerts material, and that they are working to make this closer to real-time. Honestly, 5 minutes is fine by me. I tested Boxcar a little bit last night with Thomas (ragart) “ and it worked just fine “ alerting me every time Thomas hit me with another silly comment aimed @ the justiphoneblog account. One little quirk in the app right now “ which will apparently be corrected in an update already submitted to Apple “ is that when you click an alert for an @ Mention, it takes you straight to your preferred Twitter client to view / respond, but with DMs, it leaves you in Boxcar itself to view and reply “ which is awkward, as any replies made there do not sync back to your Twitter account. If you ‘re chomping at the bit for a Twitter push solution on the iPhone, Boxcar is a good option for now “ though I have to wonder how long it will remain useful once the leading Twitter apps themselves build in the push functionality. I know I won ‘t want to keep a separate app around once I can do push right from within Tweetie or Twitterrific. 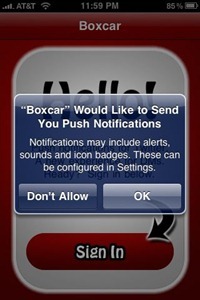 Boxcar is in the App Store now, priced at $2.99. it's not the first app, im+ had push for twitter before. True – I'd forgotten about IM+ because it's just not an app I'd want to use for anything Twitter-related. Yup, just noticed that this morning too. The challenge for all of these will be finding other features / functionality to make them appealing once push is added to leading Twitter client apps.